List of Medical Colleges in Pondicherry Total Govt MBBS Seats: Pondicherry, the Union Territory of India is known as the education hub of Southern India. It is also considered as the high rate of literacy. 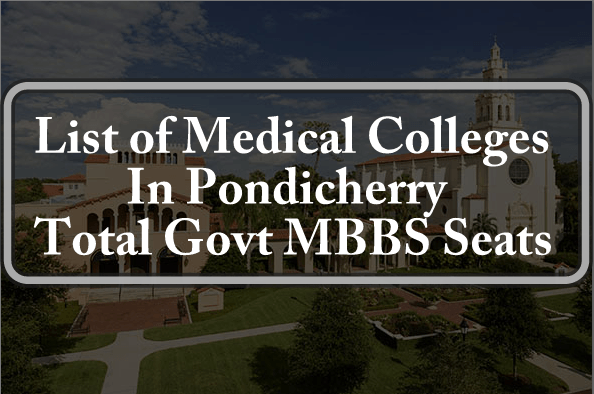 If you are thinking to take admission in Pondicherry for Medical, then you must know about the top medical colleges in Pondicherry. This year Pondicherry state government is filling all their medical seats (MBBS & BDS) through NEET 2018. So, it is now important to all candidates to appear in NEET UG 2018 Exam. Appeared candidates can check their NEET Result from the CBSE NEETs official website. All successful candidates will be called for the counselling registration and choice filling. The 1st round All India Quota Counselling will be started from July 2017. Follow the below link to know the complete counselling schedule. We have listed all top medical colleges in Pondicherry below. All medical colleges in Pondicherry will fill their MBBS and BDS seats through National Eligibility Entrance Test UG (NEET) 2018. All candidates who have applied for NEET 2017 will be able to take admission after clearing the entrance exam. Pondicherry medical authority will upload state quota merit list on their official website for 85% medical seats. The merit list and state quota counselling schedule will be announced after NEET UG Result 2018. Sri Venkateswaraa Medical College, Hospital & Research Centre, Pondicherry Pondicherry University 2007 150 Recognized when granted on or after December 2011. All candidates are suggested to keep eyes on this NEET dedicated site. We are providing all latest news regarding NEET 2017. If any candidate has any problem, query, or confusion regarding NEET 2017 admission then feel free to ask us in below comment box. Our experts would love to help you. MY DAUGHTER SCORED 87.34 PERCENTILE ( 319 marks). +2 studied in Pondicherry. Whether she will get admission in any college. How we know the state rank . where the state list available. We will publish notification regarding Pondicherry state Quota counselling. Plese state connected with us. how to get admission in MBBS? Whats the Minimum Neet score reqd to expect admission for MBBS IN Pondicherry? We hail from Kerala!! What is the minimum neet score required to expect admission for MBBS in pondicherry ? send me official link to download neet results. sir, my neet score is 332 i am belongs to obs can i get seat in govt college of pondichery.